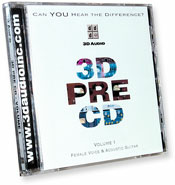 These acoustic guitar recordings are from the 3D Audio Pre CD Volume 1. Using two mics and an assortment of preamps, these recordings enable the listener to hear the influence of the preamp on the guitar sound when using the same source and microphone. 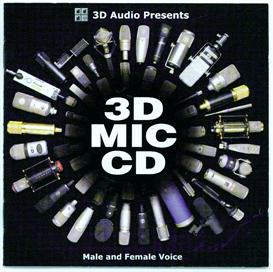 Included are 30 samples of a McPherson acoustic guitar played by Nashville studio guitarist David Cleveland, recorded in stereo using a Neumann KM-84 and an Audio-Technica 4033. Also included are the CD booklet art and pictures from the 3D Preamp Listening Party, a complete list of the preamps, with URLs and pricing, a description of the testing procedure and a key to identify the preamps. Preamps included are: Amek 9098 Dual Mic Amp, Aphex 1100-Tube, API 512, Audio Upgrades High-Speed Mic Preamp, Avalon VT-737, Buzz MA-2, Cranesong Flamingo, Daking 52270, dbx 386, dbx 786, D.W. Fearn VT-2, Earthworks LAB 102, Focusrite Red 1, Focusrite ISA 110, GML 8300, Grace Design 201, Great River MP-2MH, Hardy M-1, Langevin, Mackie 1604 VLZ Pro, Manley Dual Mono, Millennia HV-3B, Millennia M-2B, Neve 1081, Oram MWS, Presonus MP20, Sytek, Vac Rac, Vintech 1272. Produced by Lynn Fuston.